As we prepare for the 2015-2016 season ahead of us, we will begin to analytical break down some aspects on the Jets and how to best optimize the roster. We begin the series looking at the Jets performance in special teams situations, starting with forwards on the power play. Numbers are limited to minutes playing as a Jet only for 2011-2015. The top power play producer was Tim Stapleton, who enjoyed both an extremely high on-ice and personal shooting percentage under limited minutes. The Jets other top power play producers have been Blake Wheeler and Bryan Little, plus the two undersized, but highly skilled, Kyle Wellwood and Mathieu Perreault. Active Jets’ forwards power play numbers for 2011-2015 under all teams. A team’s non-blocked shots per 60 minutes (or Fenwick: FF/60) has historically provided the strongest relationship with a team’s future goal scoring performance on the power play. The nearly inseparable Jets’ trio of Andrew Ladd, Wheeler, and Little have been exceptional on the power play. The team has produced a tonne of volume in non-blocked shots, scoring chances (SCF/60), and goals (GF/60). All three players have not been afraid to shoot and cary high individual scoring chance (iSC/60) production. 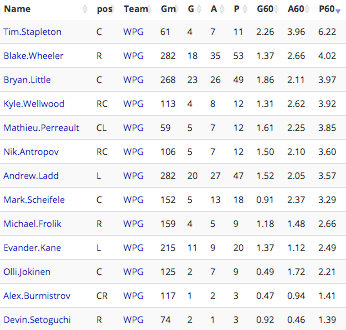 Wheeler has been the best point scorer between the three, but it’s fairly close. Perreault has joined the Jets as a power play specialist, playing on the top power play unit on the point with Dustin Byfuglien and predominately with Ladd, Little, and Wheeler on the ice as the forwards. His numbers have shot up with playing on the Jets primary unit as opposed to the Washington Capitols’ and Ananheim Ducks’ secondary units. The Jets have not produced as much in non-blocked shots or scoring chances with Mark Scheifele on the ice, but they and Scheifele have still scored at a decent pace. Whether it is sustainable or not without increasing shot and scoring chance level remains to be seen. Unless the Jets remove Perreault from his half-wall spot on the top power play unit, Scheifele will need two wingers to play with. Drew Stafford has been a decent secondary option. His on-ice numbers are low, but part of this comes from his time with the tragedy that was the Buffalo Sabres. Stafford excels in shot volume and scored above a 3 point per 60 minute pace when limiting to Jets minutes only. One possibility for the final forward position is Alexander Burmistrov. Burmistrov displayed excellent puck skills during his last time as a Jet, but was not able to put it all together and produce. He was however a strong power play option in the KHL, so maybe Burmistrov is ready. The other options are whichever rookie earns the final top-nine position out of camp. Nikolaj Ehlers has destroyed goaltenders in the QMJHL while on the power play, being able to both set up plays and shoot. Nicolas Petan was probably the best play maker in the CHL last year not named Connor McDavid and can make passes that surprise even his own teammates. Joel Armia plays a very similar game to Wheeler, although is a bit more of a shooter, and was one of the top young goal scorers the Liiga had ever seen. The Jets forwards were a much better team on the power play last season in making the most of their chances than years past. Six of the Jets’ forwards look to be all but guaranteed a spot when the Jets have the man advantage, but the seventh spot is up for grabs between the rookies and the returnee, Burmistrov.